That kind of white stuff you see? Yeah, that’s snow. Not stick to the ground snow, thankfully, but snow. I washed my bird feeders and moved the posts (I use those stamp down shepherd hooks) now that the landscaping is done and the ground will be freezing. We still have leaves on a few trees, but I’m sure they will be on the ground soon as most of them are completely bare. I looked out to see juncos at the feeder, a sure sign that winter is just around the corner. 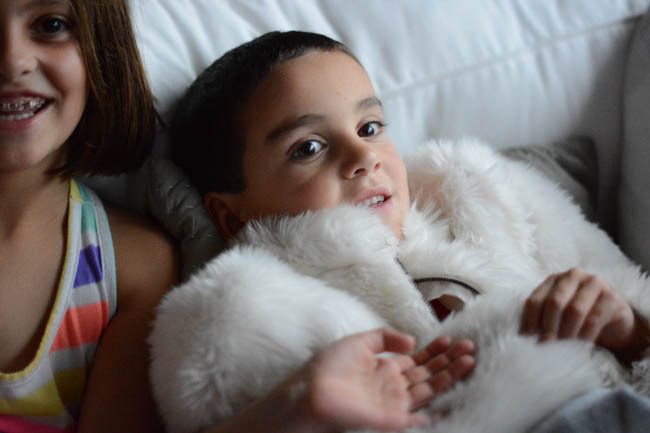 Abram has decided that means he needs to borrow his sister’s “fur” coat. Violet had decided it’s too early and is wearing a sundress in protest. Ahhh, October in Wisconsin. I’ve been busy helping with the school’s Halloween party, and making for Christmas, and fighting off the first virus (hopefully, only) of the season. The days are full and short and I’m impatiently waiting for my new cooktop so I can fill up on stew and chili and homemade chicken noodle soup. And that’s my little corner of the world lately. Quiet and snuggled in and trying to get a little rest in before the holidays start to get mad-making. I do believe the 18th is too early. It happens here from time to time (my husband likes to tell the story of the Halloween where 25″ of snow fell) but I am a firm believer in snow around mid-November. We’re supposed to warm up again next week and I hear they are calling for a milder winter. After the last 3 we’ve had, I’m all for that!! I’m trying a new thing with these holidays. My husband’s family all heads somewhere warm for a week right after Christmas (as in the 26th or 27th). We decided to take a year off this year and I’m a little sad I won’t get the warm weather reprieve or the extra time with them, but I’m hoping it cuts down on the madness in the holiday season. We’ll still do our Christmas Eve dinner with them (they live in town which is wonderful) but I’m looking forward to a slower post Christmas.